It's Reclamation Day Vault Dweller! Reclaim what the bombs took away! Reclaim the land! Emerge from the vault and rebuild America! 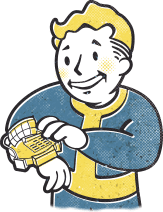 Hurry up and grab your Limited Edition Reclamation Day Lithographs before the other Vault Dwellers do!